Q: What is Lockdown Mode? 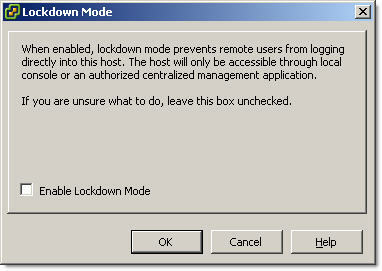 A: Lockdown Mode prevents users from logging directly to the host. The host will only be accessible through local console or vCenter Server. None of remote management options e.g. vCLI, PowerCLI script, SSH will work. When it is enabled, only vpxuser () has authentication permissions and can connect to the host remotely. Have you enabled ssh on the host? Host–> Configuration –> Security Profile –> Services —> Properties –> SSH –> Option / Start.